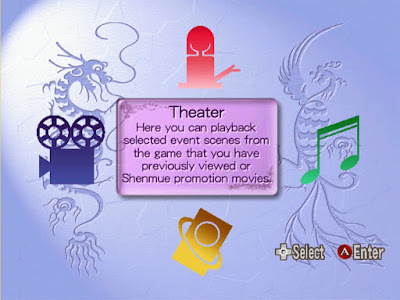 Shenmue Passport, the fourth disc in the set of discs for the first game, is a bonus disc that contains additional content related to the game, such as music and cutscene clips, that are intended to enhance the player's experience. You are prompted to select one of your save-game files at the start, and this is used to govern the information that is displayed on certain screens. The main menu of the Shenmue Passport disc. Information: seven Shemmue animated character heads introduce various features of the game, such as QTEs, Money, Battles and so on. 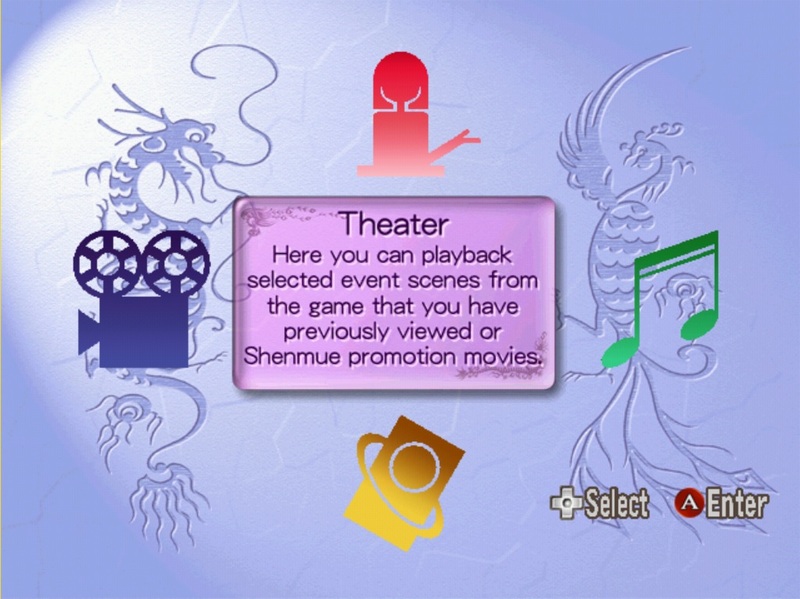 Theater: view promo video clips or select from the cutscenes you have triggered during the game. Music: here you can listen to the Shenmue theme, or other songs that you have encountered in the game so far. Passport: the online section which will be described in more detail below. 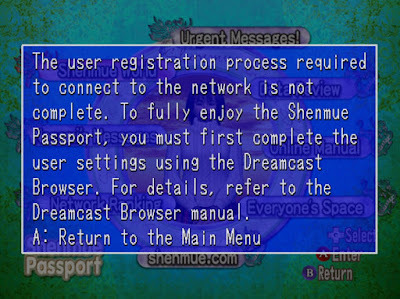 As mentioned, the online section assumes an internet connection, specifically to the server that was set up for the release of Shenmue. Unfortunately, it was closed down by Sega in March of 2002. The issue is that upon entering the Passport section, an initial check is made for an internet connection. If one cannot be established, an error message is displayed and you are bounced back to the top menu. Without a network connection, an error message is shown. 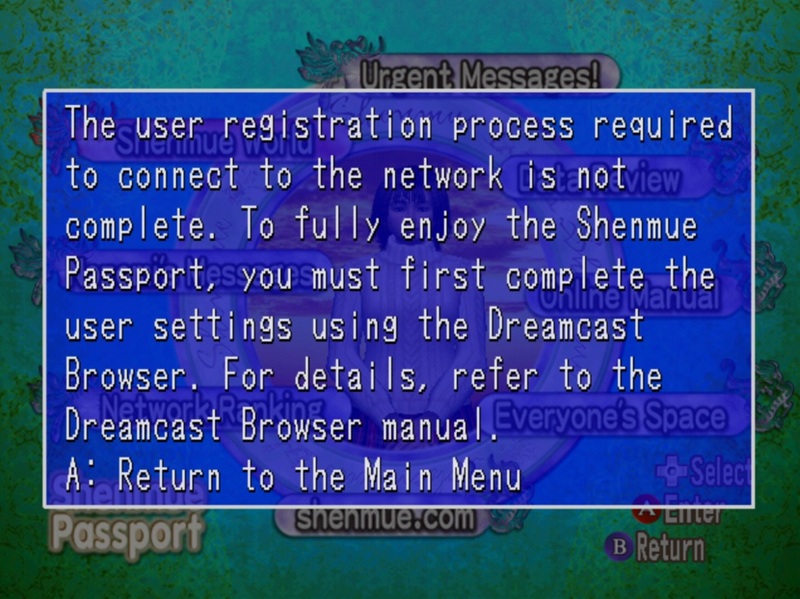 Enterprising Dreamcast enthusiasts have found ways to get the console online through use of hardware & software (such as a DreamPi - custom software combined with a Raspberry Pi and a USB dial-up modem), and these methods can be successfully used to allow access to the online section of the Shenmue Passport. But the thought that will have crossed the minds of many Shenmue fans is that would be nice if extra hardware and additional set-up could be avoided altogether. In short: a software-only solution. 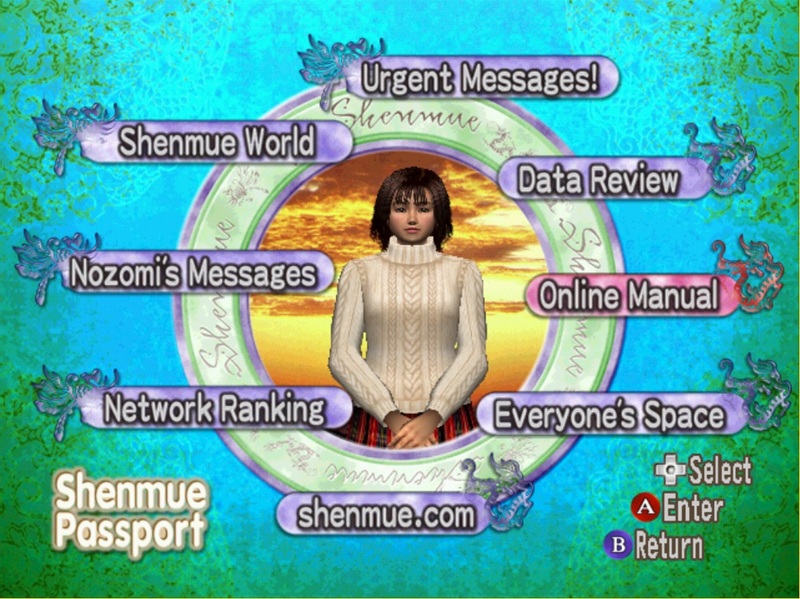 The Shenmue community is known for the passion and of its fans, and this time a strong case was made by BlueMue on the Shenmue Dojo forums for the community to direct its attention to perhaps one of the last bastions of Shenmue that may never be properly experienced by most players - the online portions of the Shenmue Passport disc. I was immediately drawn to the idea, and started thinking about how we could tackle it. Three tools that came in very useful were: a debugger (Demul v0.49 - this is the only version I know of that has an enabled debugger), a memory editor/viewer (Cheat Engine) and online documentation for SH-4 assembly language. The first problem was choosing where in the code to begin the investigation, as there is a huge amount and it is easy to get lost in a tangled web of low-level instructions. Locating the text of the connection error message ("The user registration process...") seemed a logical place to start. Having tracked down the code that accessed this piece of text, I worked backwards through the code logic from that point, looking in particular for checks in the code that would have the effect of causing the message to be displayed (or not). This part took the most time, but after tracking through false leads and dead-ends, I discovered a check that fit the ticket - disabling this check caused the code to skip the connection check and continue straight through to the next menu screen. Success! Instructions for applying the patch to a disc image are given at the end of this article, in the section named "Patch: Instructions". The menu inside the online section. Nozomi's Messages: a place where Nozomi once gave hints to the player, now devoid of messages. Network Ranking: screens for displaying global high-score rankings for various arcade games in Shenmue. Although empty now, music from each game can be enjoyed. shenmue.com: this once displayed the now-defunct Shenmue.com website. Clicking it plays a snippet of music then returns back to the menu. Everyone's Space: from here you can visit the Shenmue Goodies page or the Free Market (capsule toy trading). The What's New category is "under construction". Online Manual: a number of topics are displayed, but none are accessible. Data Review: incredibly detailed stats on your game to date. The speed of text scrolling can be increased by holding down one of the controller buttons. Urgent Messages: a "Topics" icon can be selected here, leading to a screen with an image of Nozomi; however I found this to be a dead-end requiring a reset; the B button would not take me back to the menu. I've taken some footage of each area in the video below. Some differences can be observed compared to the case where the disc is run on a Dreamcast with an internet connection. For example, with a real connection there is a text message on many of the screens saying "The required data cannot be retrieved at this time. Please try again." which is not displayed with this hack. Edit: clarified information on the disc image format required & added patch for PAL version. If you have a CDI or MDF image file of the Shenmue Passport disc, just apply the patch directly. For a GDI image, apply it to the track07.bin file (thanks to Radar on the Shenmue Dojo for testing and confirming). The instructions vary slightly, depending on whether you have an NTSC or PAL version of the game. If you are not sure, it is fine to try both as only one of the search sequences will be present. 1) Load the disc image into your favorite hex editor. 3) Repeat the search in Step 2 one more time. If the sequence is found a second time, update it in the same way. 4) Save the image. Done! I hope this patch will open up the online section of the disc to a wider audience than before. There is plenty of scope for experimentation with the content within. 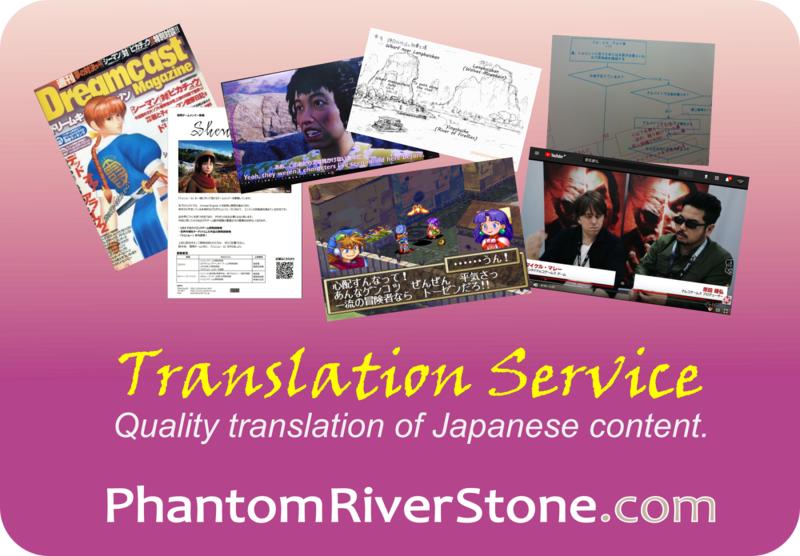 Join Phantom River Stone on Facebook & Twitter! 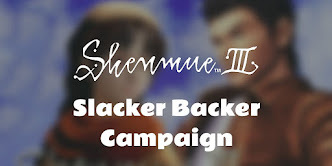 We want to try to reach as many Shenmue fans as possible! If you are interested in more Shenmue content like this, please take a moment to Like the Phantom River Stone Facebook page and Follow us on Twitter. Thank you! One possibility is PAL vs NTSC. 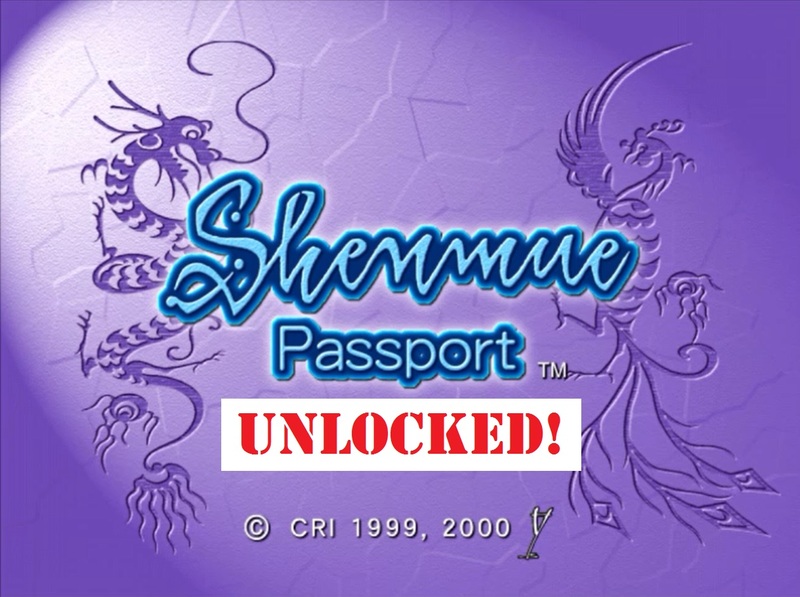 The patch at the moment is confirmed for the NTSC version of Shenmue Passport (on a cdi image). If you are using the PAL Shenmue, I will be publishing a separate patch for that version as it turns out the code differs slightly. Update: the patch now covers both PAL and NTSC - see the refreshed instructions in the post. I open it with NullDC after editing the PAL version and it says "Failed to load image." Any fix for this Switch? Sounds like the image has been corrupted somehow when saving. What disc image format did you try it on (GDI, CDI etc)? I did the Hex editing successfully and when I go on it, it works fine but it keeps coming up with dialing in the middle, it goes after a few minutes but returns when I go on the Shenmue.com and a few others which requires online connectivity. My question is, is this normal or have I done something wrong? Even with the hack, there are some screens that just won't work as they need a real online connection to SEGA servers (which of course are no longer running). 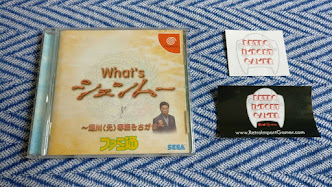 These include Shenmue.com, the online manual pages, Nozomi's messages, the highscore ranking tables and swapping a winning can for Shenmue Goodies. Ok so i don't know if anyone still uses this but i opened track07.bin and follwed the steps to apply the patch that worked ok but when i load disc 4 it freezes on the sega screen. Does the GDI load fine when the track07.bin is reverted back to the original? One thing to double-check is that, when updating the file, the mode of the hex editor is overwrite (not insert). After updating track07.bin the file should have exactly the same length as before. yes the GDI does load fine when i change the 4 byte back to 98 23 0F 89, it's only when changing too 98 23 27 27 and then load the GDI it then freezes and never get's past the sega screen. I do open track07.bin once i have applied the patch too make sure that i find line 98 23 27 27 and it is there soo it must be overwriting and not just inserting. Any hex editor should be fine. I applied the patch to an NTSC CDI image of the Shenmue passport using HxD just now, and confirmed that the disc image runs fine after saving the edit, running on Demul v0.7. If you are still having trouble, you can drop me an email (it's on the About Me page). user registration process too connect to network, and then it takes me straight back too the main menu. It sounds like the patch didn't save properly, as that is the usual behavior when the internet connection check is there. Since it seems you're not having much luck, perhaps you could look to see if there is an image online someone has already applied the patch to. hmm yea i will see if i can try and find an image but what with all the crackdown lately on "certain sites" it's getting a lot harder too find such patched files and games.